A Nigerian couple have become childless after all three of their kids died as a result of sickle cell anemia. They lost their daughter first. Two years later, they lost a son. Their last son died three days ago, after years of living with sickle cell. 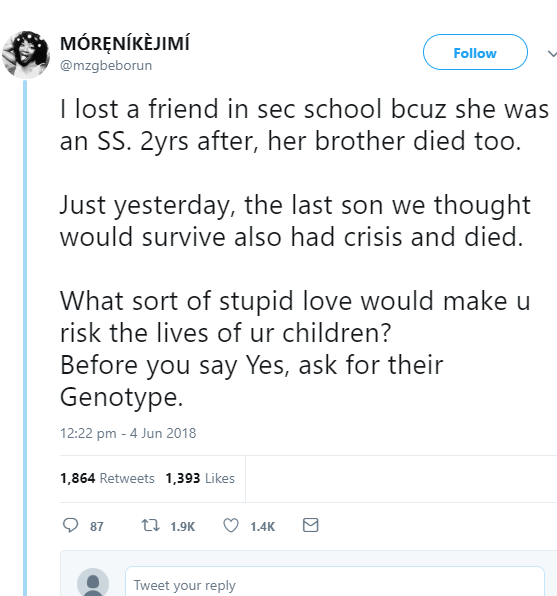 A Twitter user who knows the family shared the story and cautioned lovers to be aware of their genotype before talking about marriage. 0 Response to "Nigerian Parents Lose All Three Children To Sickle Cell Anemia"